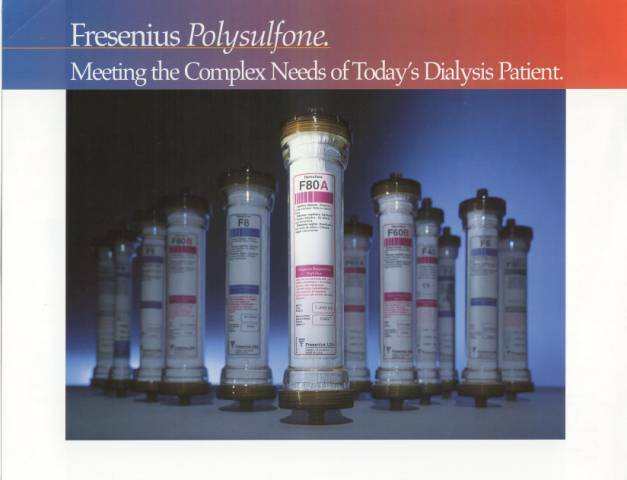 ��������� The heart of hemodialysis is the dialyzer.� A very large and competive market, with several manufacturers, serves the needs of the hemodialysis community.� A typical specification flyer for hemdialyzers is shown in the picture immediately following (this is not an endorsement for Fresenius products). 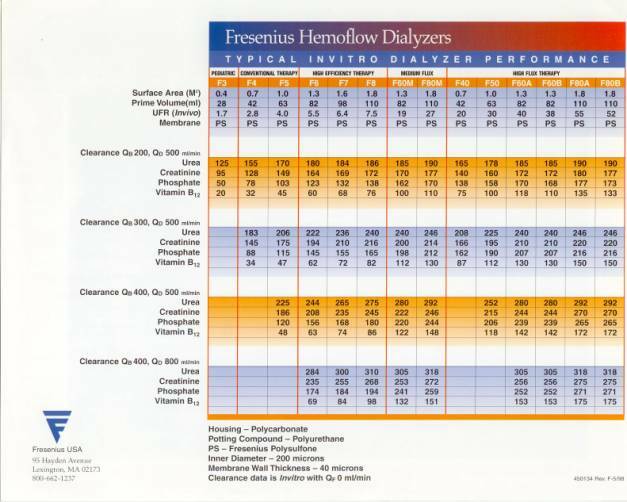 ��������� The back side of the flyer typically contains dialyzer specifications, as shown here. ��������� The most common dialyzers are hollow fiber devices that contain thousands of hollow fibers housed in a hard plastic, typically polycarbonate, shell.� Blood flows through the dialyzer on the interior (lumen) of the fibers.� Dialysate flows through the dialyzer on the exterior (shell-side) of the fibers. ��������� Depending upon the manufacturer, the fibers are made from such biocompatible materials as cellulose acetate or polysulfone.� The fibers have a microporous structure that permit the diffusion of small molecular weight species from the blood to the dialysate.� The diffusion rate can be expressed in terms of the dialyzer clearance of the molecule.� The specification sheet above shows the clearances of various molecules for indicated dialyzers under different blood and dialysate flow rate conditions.� The large variety of dialyzers permits physicians to appropriately specify a hemodialysis treatment to meet the needs of a patient.